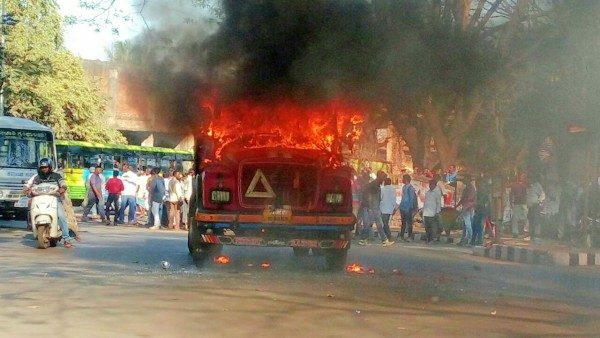 A youth was killed in an accident at Sangolli Rayanna Circle this afternoon, after which the truck was set on fire. The accident occurred around 3.30 PM at the Sangolli Rayana Circle, the deceased boy is from Khanjar Galli as per the information and has been identified as Inayat basir Ahmad shaikh aged 20. The fire was doused by the firefighters after wards. Shaikh, mechanic by profession was riding his bike and he lost control on his bike while turning and was caught in the rear wheel of the truck which was moving in the same direction, killing him on the spot. A truck was set on fire near Sangolli Rayana Circle after it crushed a school going kid from Khanjar Galli. Our beloved police can only catch people without helmet, rest all are their relatives. They will wake up only when some one near and dear of top cop is the victim of such incident. Request the top authorities to take some action to avoid such incidents. It happened at RTO where usually police officials are present. Instead of the money setting the truck on fire, they should have caught hold of the driver instead. What would burning the vehicle help in?? And yes, why are heavy vehicles allowed in city during peak hours of the day. The time this incident happened, there are school children’s on the road as well. And the video shown above is just after the burning of truck. There is for sure someone who has recorded the whole thing from the start. Why isn’t the one who set fire caught?? Why is just the half video uploaded?? Lastly the road and traffic rules should be made even more strict. Fine for every small rule being broken. May he rest in peace. May Almighty give strength to his family. Why no arrests were made for people who set truck on fire??? Just why heavy vehicles are allowed In city during office hours. A lot many number of times this issue was bought to the notice of local authorities, why no action is being taken?